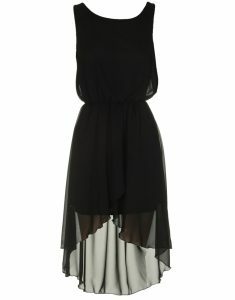 High low chiffon dresses have a unique appeal and charm. You can try a black, sleeveless high-low dress with a silver lining for a cocktail party. Wear hanging silver earrings and a nice neck piece as well as high heels. You can take a matching silver clutch. If you have chosen a high low wedding gown for the big day then design the same patterned outfit for your bridesmaids. Colorful skirt-patterned outfits can be worn to casual parties.